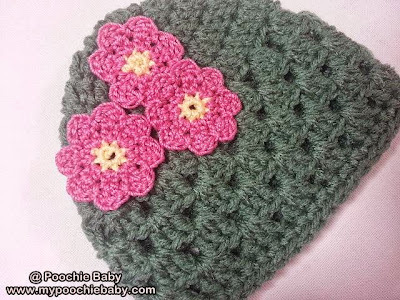 This sweet little hat is so easy and quick to make! Add some flower embellishments to make it really girly... or just leave it simple. This hat would look great made in stripes for a little boy. It takes very little yarn to complete. 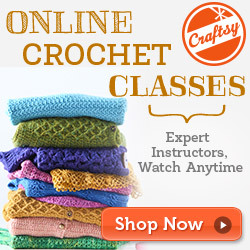 So, raid your yarn scraps and make as many as possible. The finished hat will fit a baby up to about 5 or 6 months old, depending on head size. You can always make a larger hat by increasing the hook size. With a G hook, CH 4 and form a circle with a SS. R1 - CH 2 and DC 11 times in the circle. Join with a SS. R2 - CH 2 and DC twice in each stitch around the hat. Join with a SS. R3 - CH 2 and DC in the next two stitches, 2 DC in the next stitch, DC in the next two stitches, 2 DC in the next stitch. Repeat this pattern until you reach the end. Join with a SS. R4 - CH 2 and DC in the next three stitches, 2 DC in the next stitch, DC in the next three stitches, 2 DC in the next stitch. Repeat this pattern until you reach the end. Join with a SS. 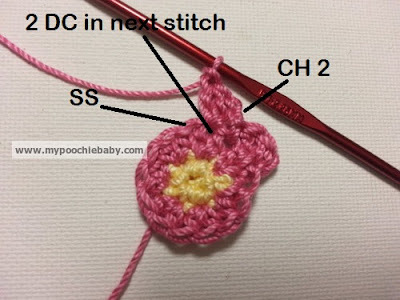 R5 - CH 2 and DC in the next four stitches, 2 DC in the next stitch, DC in the next four stitches, 2 DC in the next stitch. Repeat this pattern until you reach the end. Join with a SS. 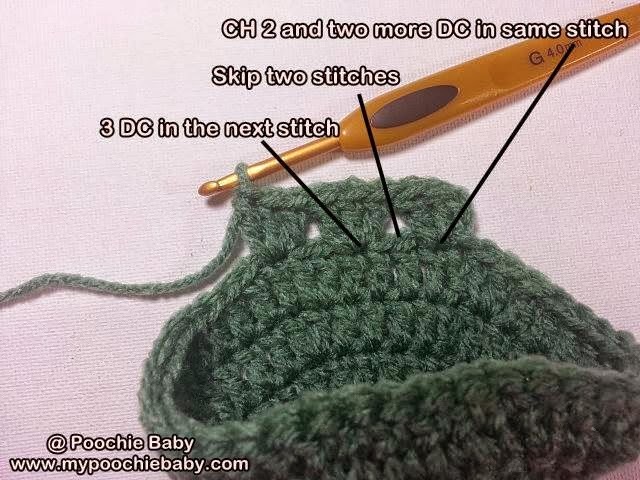 R6 - CH 2 and DC twice into the same stitch. Skip two stitches and 3 DC in the next stitch. Skip two stitches and 3 DC in the next stitch. Repeat this pattern until you reach the end. Join with a SS. 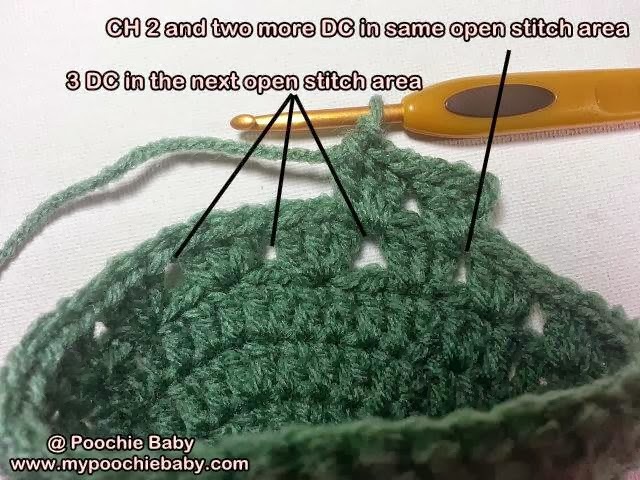 R7 - CH 2 and DC twice into the same open stitch space. 3 DC in the next open stitch space. 3 DC in the next open stitch space. Repeat this pattern until you reach the end. Join with a SS. R11 - CH 1 and SC in each stitch around. Join with a SS and tie off. 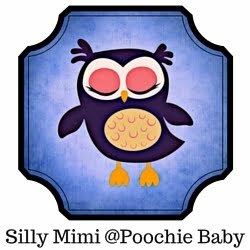 Please DO NOT reproduce this pattern or re-post it on your website or blog. BUT, please feel free to link to this pattern as much as you like!! Love this pattern. I did a two tone version in just about an hour and a half. Hi Christine... I love this hat too! I think it would make a perfect accessory for an easter dress!